Nature and authenticity will be everywhere during your stay at the Yelloh! Village Le Couspeau. Hiking trails and mountain biking routes await you, right beside the campsite. A perfect way of discovering the countryside of Drôme, the forest of Saou and the fantastic views of the Couspeau Valley. Feeling like cooling off a bit? The team of receptionists will be able to tell you about amazing beaches alongside some untamed rivers, just a few kilometres from the campsite, or about those beside an artificial lake in the neighbourhood. Children and adults will love it! Drôme, between the Alps and the Mediterranean , is a lovely, varied region, which you'll love and find enchanting. Enjoy a bit of time strolling through its mediaeval streets , looked over by a tall tower, and the famous villages of Poët Celard and Poët Laval, before stopping off at a local market, where you'll be able to try some of the local produce. 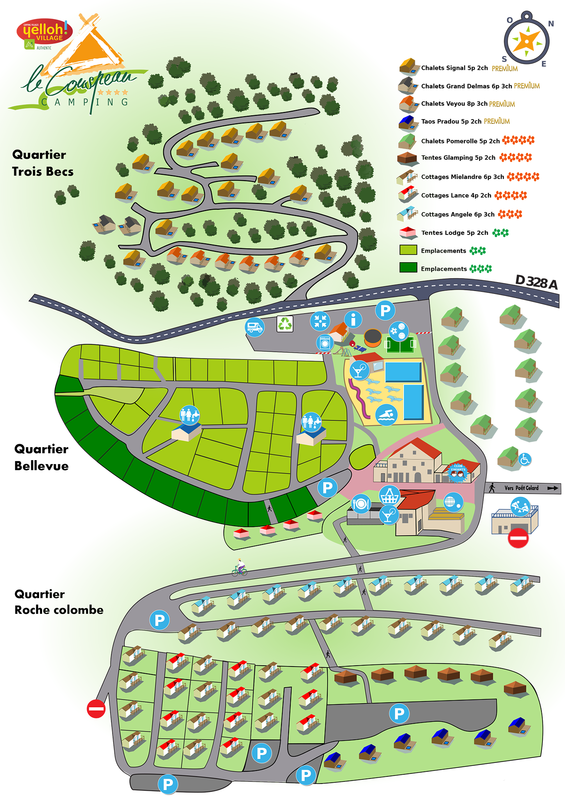 Children will also have a great time at the crocodile farm, just 60 km from the campsite, while foodies will be able to stop off at Montélimar to try some of its world famous nougat. There'll be something for everyone during your camping holiday at the Yelloh! Village Le Couspeau!